Meanwhile, in medium bowl, beat Salted Caramel Cheesecake Filling ingredients with electric mixer on medium speed just until smooth and well combined. Using melon baller, scoop out center of each cupcake about 1 inch deep. 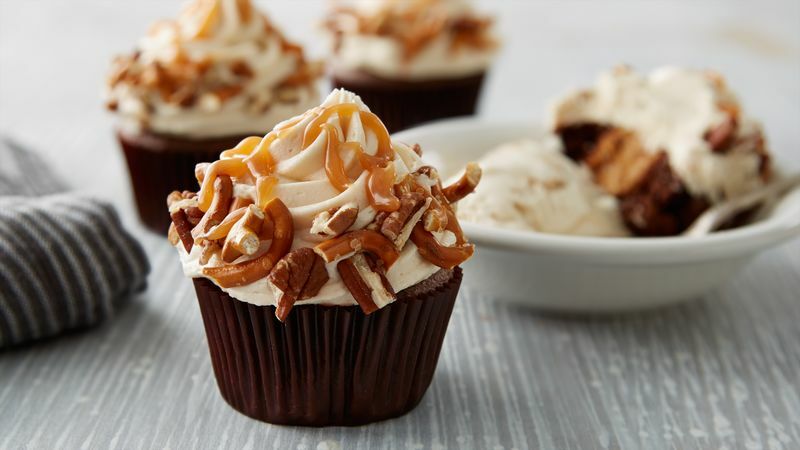 Fill each cupcake with 1 tablespoon filling. To make Salted Caramel Buttercream: In large bowl, beat butter with electric mixer on low speed until smooth. Gradually add powdered sugar, 1 cup at a time, beating until combined; beat in vanilla. In large microwavable bowl, microwave caramels and 1 tablespoon of the milk uncovered on High about 1 minute or until caramels are melted; stir until smooth. Stir caramel mixture and kosher salt into buttercream mixture until combined, adding remaining milk until smooth and spreadable. In small bowl, mix chopped pecans and crushed pretzels. Place buttercream in large decorating bag fitted with large open star tip. Frost 1 cupcake at a time with buttercream, then roll immediately in pecan mixture. Repeat with remaining cupcakes, frosting and rolling in pecan mixture.